The simple Pelican Hook / Gate Hook seems to befuddle many crew members (and a fair number of skippers also). 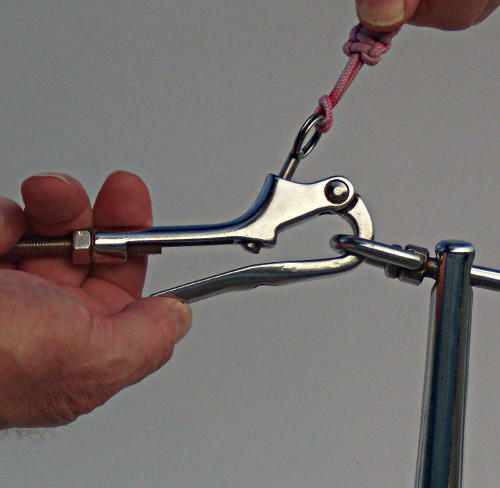 Here are some simple tips to take the mystery out of the Pelican Hook/ Gate Hook. Improper operation of the Pelican Hook/ Gate Hook can damage the Pelican Hook or cause it to open up unexpectedly causing the gate of Lifeline to open up. That can lead to crew members falling overboard if the lifeline is not secure. Even if a crew member is just using the lifeline to help a bit with balance, suddenly having the lifeline go slack can be a very bad surprise and can lead to injury or crew going overboard. 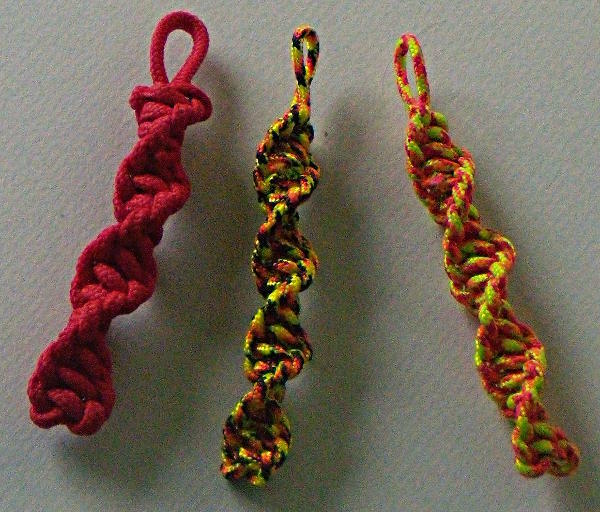 If you want to make a lanyard similar to the one shown here, please see the article, Making Pelican Hook Lanyards & Key Fobs. The lanyards also work very well on shackles. 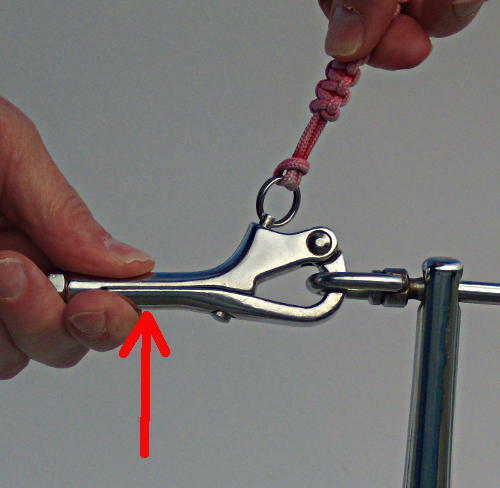 Make releasing shackles easier in cold weather with cold and wet fingers, or fingers that have gotten stiff or arthritic with age. Your crew will love you for the lanyards!! Squeeze the Pelican Hook/ Gate Hook at the Red Arrow FIRST. Squeezing the Pelican Hook / Gate Hook relieves the pressure on the locking pin. 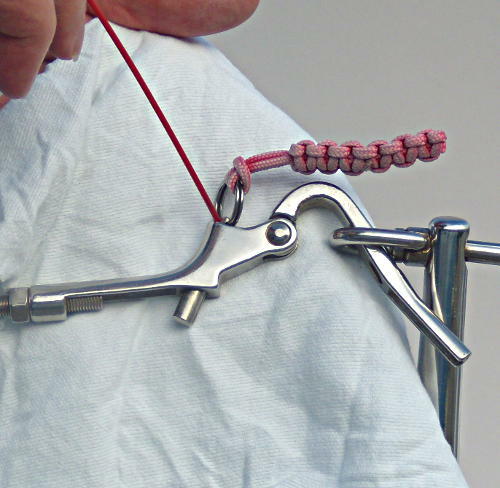 After squeezing the Pelican Hook / Gate Hook firmly, GENTLY pull on the lanyard and the pin. Many people will just grab and pull on the lanyard, just pulling hard on the pin without squeezing the base of the Pelican Hook / Gate Hook to relieve the tension can cause the ring to break and the pin to come shooting out of the Pelican Hook with the pin bouncing into the water. Pelican Hooks / Gate Hooks are designed to not open when the pin is under load, squeezing the base of the Pelican Hook relieves the load on the pin. 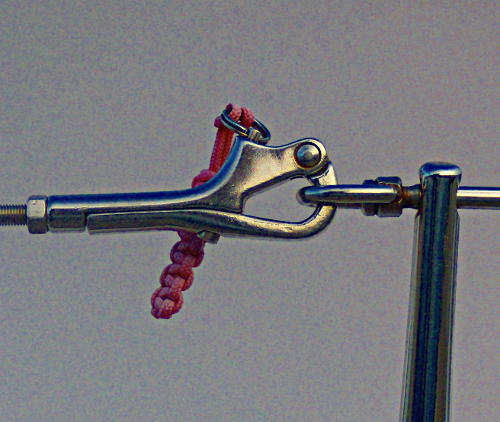 Pull the pin GENTLY after squeezing the Pelican Hook / Gate Hook to remove any tension on the pin. 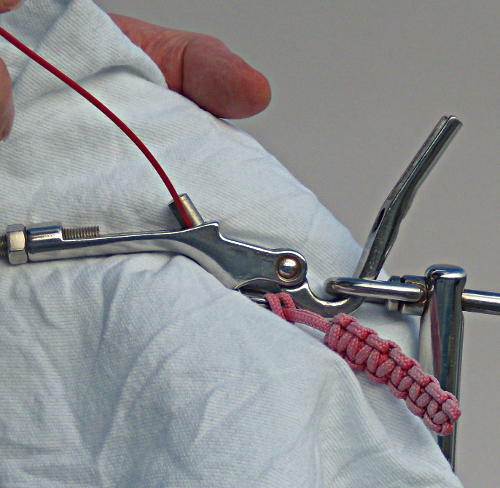 Gently release the Pelican Hook / Gate Hook arm while the pin is retracted. Be careful at this point as the lifeline is no longer helping with safety so it is easier to fall into the water. Many boats have a policy of calling out “Lifeline Down” or “Gate Open” every time a lifeline is opened. Bring the Pelican Hook / Gate Hook arm back until it lightly touches the tip of the pin. 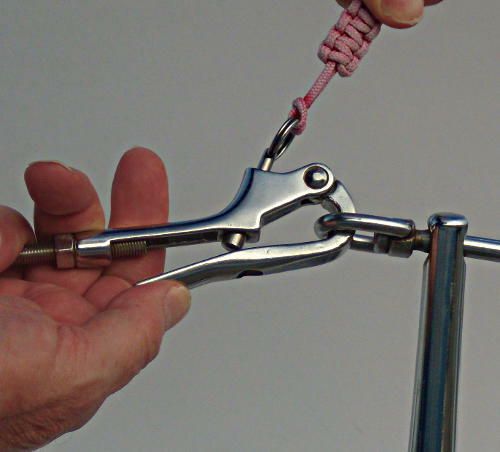 Gently pull the pin on the Pelican Hook / Gate Hook back while following the pin with the arm. When the arm is back against the body of the Pelican Hook / Gate Hook release the pin and let the pin extend all the way into the hole on the arm. The ring should be against the body of the Pelican Hook / Gate Hook. 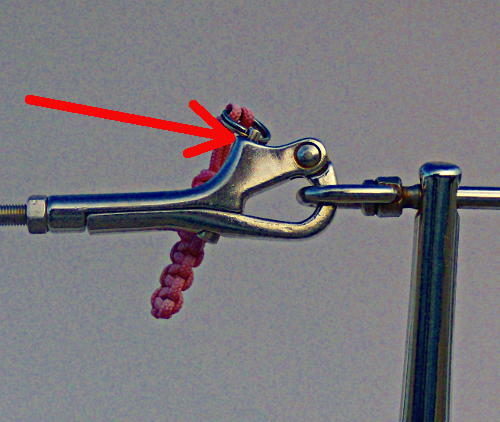 If the Pelican Hook / Gate Hook Pin is not pulled back, the hook can jam on the edge of the arm. Many people will try and force the Pelican Hook / Gate Hook closed when the pin and the arm are jammed. The pin needs to be retracted and then the Pelican Hook / Gate Hook will close easily. 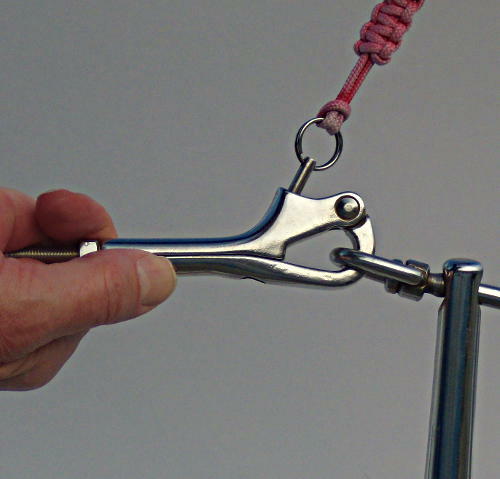 Make sure the Pelican Hook / Gate Hook Pin is fully down and seated to prevent the hook from opening by accident. 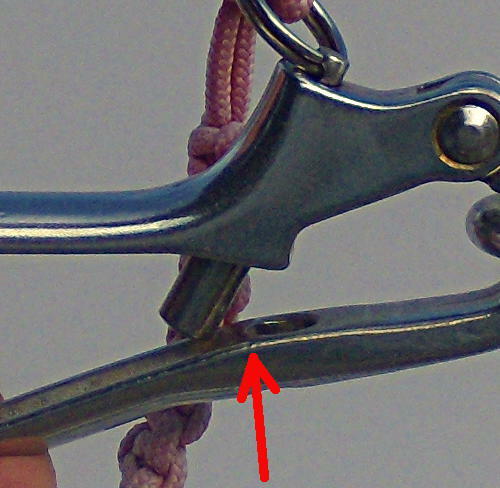 Many times crew members will barely get the pin down a little bit and the Pelican Hook / Gate Hook will pop open with no warning. The ring can usually be seen from some distance away so the double-check is easy to do. Use a dry lubricant such as a Silicone or Teflon based lubricant. Do not use an oil or grease based lubricant, they will collect dirt and grime. Lubricate the Pelican Hooks / Gate Hooks a few times a year depending on usage or when the Pelican Hook / Gate Hook becomes a bit stiff to open and close. Use a rag to catch the excess lubricant and keep the lubricant from dripping onto the deck of the boat. Soak the top of the Pelican Hook / Gate Hook pin with lubricant, let the lubricant run down the pin and inside the Pelican Hook. Also spray lubricant on the large end of the Pelican Hook / Gate Hook pin and let the lubricant run inside. Operate the pin several times and turn the pin around to make sure the lubricant reaches every nook and cranny inside the Pelican Hook / Gate Hook. 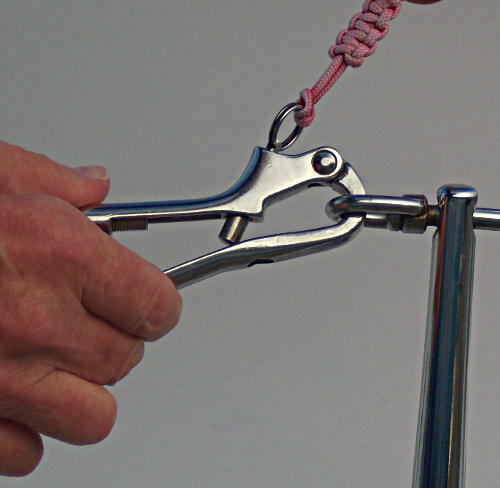 Be sure and wipe excess lubricant from the outside of the Pelican Hook / Gate Hook so the crew does not get lubricant on their hands when they touch the Pelican Hook. Update March 29, 2015: Added “Gate Hook” – Gate Hook & Pelican Hook are sometimes used to describe the same fitting, both by the manufacture & Marine Supply Catalogs. This entry was posted in Boating Safety, Sailing and Boating Skills and tagged boat equipment, crew skills, safety equipment. Bookmark the permalink. great tip but isn’t that a gate hook every pelican hook I’ve ever used is a two park hook held together by a link that goes around it so it can be released under load. what your showing is a gate hook all you said was true but adds to the confusion if you call it something its not. Looking at the Port Supply (West Marine) 2013 Catalog, the manufacture Johnson Marine refers to “Pelican Hook” on a fitting like the one I use for the pictures, on the same catalog page the term “Gate Hook” is also used for a fitting that looks identical. A “Tubular Pelican Hook” is a fitting that matches your description. I have added “Gate Hook” to the article with an explanation on why both terms are used. Yes a bit confusing in a way when the usage by sailors is taken into consideration. thanks for your help & thanks for visiting my site – Hope you have a nice sailing season.